"Good Stories for Boys and Girls"
Uncle Rocky, Fireman, Book #1 ﻿"FIRE!" In 1990, when Ben and Luke were 6 and 4, Katie decided I should spend time with them and put them to bed each night with a story. Uncle Rocky, Fireman began for us a father-son time that was great fun then, produces wonderful memories now, and with Ben and Luke now 32 and 30, is being happily carried into the future with our grandchildren. We wrote and illustrated the Uncle Rocky, Fireman stories in the hope that you will have the same fun with your kids as I did with Ben and Luke. Please download the free book and take advantage of the coloring pages. If you like the stories, please pass on the website to as many other Moms and Dads as you know. 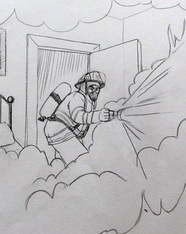 Click this button to go to the Unit Study that accompanies Uncle Rocky, Fireman #1 - FIre! Story time for Uncle Rocky, Fireman #1 Fire!